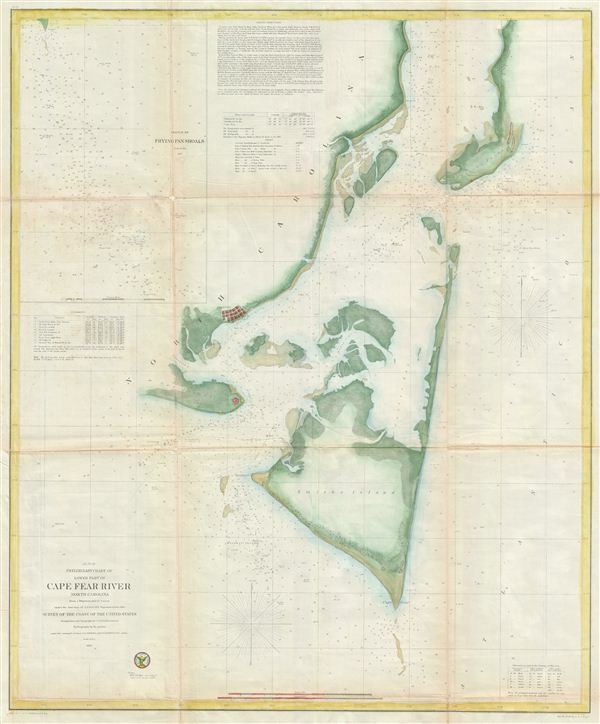 A preliminary chart of the U.S. Coast Survey's work around Cape Fear. Preliminary Chart of lower part of Cape Fear River North Carolina from a Trigonometrical Survey. One of the largest and most striking U.S.C.S. Map of North Carolina's Cape Fear. extends from Federal Point south to the tip of Cape Fear and then west past Smithville and Fort Caswell to Oak Island (roughly 78.04 Longitude). Offers superb coastal detail of the North Carolina mainland as well as Smith's Island and Federal Point. From a nautical perspective the map offers a wealth of depths soundings and sailing instructions, as well as information on shoals, light houses, and tides. Produced on a scale of 1:30,000. Represents the early work of the Coast Survey in this region. The triangulation for this chart was calculated by C. P. Bolles. The topography was completed by C. P. Bolles and J. S Bradford. Hydrography was accomplished by T. A. Jenkins and J. N . Maffitt. Prepared under the supervision of A. D. Bache for the 1855 Report of the Superintendent of the U.S. Coast Survey. University of North Carolina, North Carolina Collection, Cm912m U58cf1.